Concrete Waterproofing by chemical systems, Xypex Concentrated and Xypex Admix C1000, by crystallization, as well as with our product prenopol. Repair of waterways and joints by using Xypex Patch'n, resins and gels. 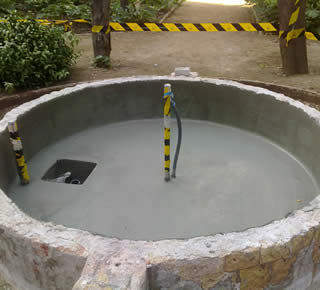 Waterproofing concrete Waterproofing concrete, chemical treatment for waterproofing, protection and repair of concrete. APPLICATIONS: Walls, slabs, tunnels, reservoirs, swimming pools, water treatment plants for drinking water, etc. Waterproofing concrete Waterproofing concrete, chemical treatment for waterproofing, protection and improvement of concrete. APPLICATIONS: Added to the concrete at the time of mixture, it makes a catalytic reaction, forming soluble and insoluble crystals inside the pores and capillaries of the concrete, creating a permanent sealing against penetration of water and other liquids. Waterproofing concrete Concrete waterproofing made of hydraulic cement compound for filling and concrete repair. Instant setting. Polymeric coating Is a liquid waterproofing membrane, acrylic-polyurethane, colored, high weather resistance, ultraviolet rays and permanent contact to water. APPLICATIONS: Roofing new or rehabilitated areas difficult to apply, tanks, walls, gardens, etc. Resins for injection Injection resins system based on resins injections, suitable for consolidating, fill and seal waterways where other products are carried by the pressure of the water. APPLICATIONS: Repair cracks, fissures, treatment of anchoring points, elevator holes, channels, etc..
Waterproofing gels System based on gels injections, suitable for consolidating, fill and seal waterways where other products are carried by the pressure of the water. APPLICATIONS: Repair cracks, fissures, treatment of anchoring points, elevator holes, channels, etc. Do you want information about Waterproofing of swimming pools?